As they do each and every year, the various leagues in the Kansas City roller derby community are teaming up for the annual KC Polar Plunge and 5K Strut to benefit Special Olympics Kansas at Shawnee Mission Park. This year’s event is next Saturday, February 7th, and we hope to see everyone out there donating to this amazing cause… and, you know, running a 5K and jumping into a freezing lake. We’re told the Kansas City Roller Warriors, Fountain City Roller Derby, and the Cowtown Butchers will have members present to take part in the festivities, so come on out and meet some of your favorite flat track stars and help them support a great cause. Click the graphic to enlarge. If you’re not able to make the Plunge itself — or even if you are — you can donate to the KC Derby team, who as of press time, has already collected well over $1800 for this event. Click here to go straight to the KC Derby team page and contribute to this outstanding organization! 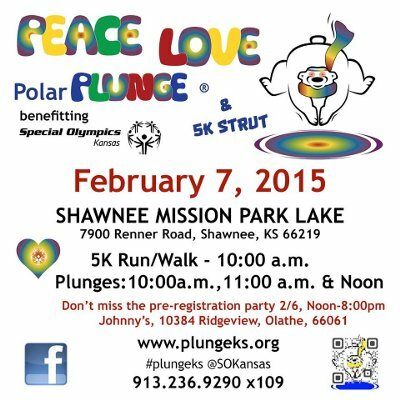 It’s always a great time and we can’t wait to see everyone out there next weekend at this year’s Polar Plunge and 5K Strut benefiting Special Olympics Kansas!